Each year, scholars village festival to be held in the first 8 Saturday 1 month. 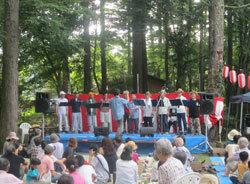 It will be held also 8 month 6 date (Saturday) this year. Stage to participate in even the festival who are in the villa is a large turnout. The photo is your performance of Wee prime choir. Looking forward to your this year!